Home » PRODUCTION AND CHARACTERIZATION OF CURDLAN FROM AGROBACTERIUM SP. PRODUCTION AND CHARACTERIZATION OF CURDLAN FROM AGROBACTERIUM SP. Division of Microbiology, School of Biological Sciences, CMS College of Science and Commerce, Chinnavedampatti, Coimbatore - 641049, Tamil Nadu, India. ABSTRACT: Biopolymers are gaining more importance in our day-to-day life, due to the hazardous effect of synthetic plastics in our environment. Curdlan is one of the biopolymers, which has a broad field of applications in the food, pharmaceutical and medical industries. It is a polymer of glucose, produced by the family members of Rhizobiaceae. Curdlan [(1→3)-β-D-glucan] production takes place under the nitrogen starvation period during the cell growth. Fifty Agrobacterium sp. were isolated from root nodules collected from different localities of Coimbatore and Palakkad and screened by Aniline Blue method for the production of curdlan. The species was confirmed as Agro-bacterium fabrum by 16S rRNA sequencing. The accession number given by GenBank is MF521602. Curdlan was produced using different carbon and nitrogen sources. The extraction was done by Sodium hydroxide: Acetic acid precipitation. 0.12 gm of crude curdlan was obtained from 1.2 gm/100 ml of biomass. The product was stored for further research. Exopolysaccharides are the secondary metabolites produced by a vast group of microorganisms. One such group of organisms which produce these types of polysaccharides is the Rhizobiaceae family. The genus Agrobacterium has the nature of producing a special group of polysaccharides (1→3)-β-D-Glucan, termed as curdlan. These nitrogen-fixing root nodule bacteria have the ability to produce these special polysaccharides in the nitrogen starvation conditions. Gelling and emulsifying nature of curdlan has gained application in the industrial sectors 1. Xanthan, gellan, and curdlan are the three exopolysaccharides, which has been approved as food additives by the food and drug administration 2. Curdlan clumps as a strong gel totally in the thermal suspension and never return to aqueous state again 3. Structural analysis of curdlan is given as β-(1→3) linkage with a homopolymer of D-glucan 4. The degree of polymerization (DP) of unbranched curdlan was roughly measured as 450 5. It has a major impact on the clinical level, as it can elicit the immune response against many pathogenic microbes and drastic disorders like cancer 6. Large-scale production of exopolysaccharide curdlan is performed mainly by Agrobacterium sp. ATCC 31749 7. Curdlan biosynthesis requires the participation of four major genes crdA, crdS, crdC and crdR 8. NtrB and NtrC molecules give a hand for the synthesis of curdlan under nitrogen retardation period 9. Sample Collection: Root nodules of leguminous plants such as ground nut and pea plants were collected from the different locality of Coimbatore and Palakkad carefully without disturbing the nodules in Ziplock bags and brought to laboratory for further research. Isolation of Agrobacterium sp. and Screening for the Curdlan Production: Root nodules were washed under running tap water to remove the excess soil, and surface sterilized with 1% mercuric chloride solution 10. Sterilized nodules were carefully handled with sterile forceps and pressed under the two sterilized glass slide to extract the fluid inside the nodules. The extract was streaked on the sterile yeast extract mannitol agar plates, with sterilized loops 11. Isolated organisms were inoculated into a yeast extract mannitol agar containing Aniline Blue reagent 12. Characterization of Positive Agrobacterium sp. : Agrobacterium isolates characterized by congo red test 13, growth on 3-ketolactose test, citrate utilization test, hofer’s alkaline broth 14, and growth in glucose peptone agar 15. Seed Culture Preparation, Production and Extraction of Curdlan: The inoculums for the production of curdlan was prepared by inoculating the isolates in the seed culture media containing peptone 0.5 g, yeast extract 0.5g and 1% of sucrose as a carbon source. The medium was kept for incubation at room temperature for 24 - 48 h. The seed culture inoculums were inoculated in the Minimal salt medium containing KH2P04, 3.0; Na2HP04, 6.0; MgS04, 0.5; (NH4)2HP04; 0.1, trace element solution- 10 ml (5g FeS04.7H20, 1g CoCl2.6H20, 2g MnS04, citrate, 1g ZnCl2 per litre of 0.1mol l-1 HCl) and 2% Sucrose as carbon source. Medium adjusted to pH 5.5 16. The inoculated flasks were kept for shaking incubation at room temperature for 76 h at 180 rpm. The extraction of curdlan was done by centrifuging the culture medium at 12,000 × g for 30 min 17, 18. The extracted pellet was mixed with the same ratio of 0.5N Sodium hydroxide at 4 ºC. The solution was kept undisturbed for 3 h at the same temperature. After that the content was again centrifuged at 12,000 × g for 40 min and the supernatant obtained after centrifugation contains the curdlan. This was precipitated by adding 10% acetic acid and was twice washed with water, acetone, and ether. The organism which gave higher production of curdlan was confirmed by 16S rRNA sequencing technique done in Yaazh Xenomics lab at Coimbatore. 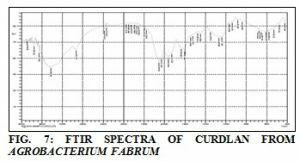 Curdlan Characterization: The extracted curdlan was further characterized by fourier transform infrared spectroscopy and band transmittance was observed. Collection and Isolation of Agrobacterium sp. : Root nodules were collected from the regions of Coimbatore and Palakkad Fig. 1. Fifty Agrobacterium samples were isolated from the root nodules collected from different regions of Coimbatore and Palakkad. Red colored mucoid colonies were obtained on yeast extract mannitol agar plates Fig. 2. Screening of Isolate for Curdlan Production: The fifty samples were screened by Aniline blue method. 7 of the isolates showed positive result by producing blue color colonies Fig. 3. Characterization of Agrobacterium sp. : The culture showed red colour colonies on the congo red test. The samples produced yellow color on the lactose agar as a positive result Fig. 4. On Hofer’s alkaline broth Fig. 5 and glucose peptone agar, the samples showed maximum growth. The samples were positive for citrate utilization test Fig. 6. Seed Culture Preparation, Production and Extraction of Curdlan: The 5 isolates showed high cell growth in the seed culture medium. A high dense growth of organism was observed in the production medium, pH 5.5 was reported as the optimal for curdlan production. From among the 5 isolates, the one which gave better production was selected for further studies Table 1. The organism was found to be Agrobacterium fabrum (A43) by 16S rRNA sequencing. The accession number given by GenBank is MF521602. This isolate was inoculated in the MSM medium with 2% Sucrose and production was carried out. It was found to produce 0.12 gm/ 100 ml of the medium. Crude curdlan was extracted by the centrifugation method, given by Lee et al., 1999 for the extraction of curdlan 19. Curdlan Characterization: The FTIR spectro-scopy showed bonds corresponding to -OH,-CH2, CH, and CH2 at spectrum transmittance 3425.58, 2927.94, 1346.31, 1323.17 cm-1, respectively. An absorption band at 883.40 cm-1, indicates the presence of (1→3)-β-glycosidic bonds Fig. 7 20. The report was compared with the β-configuration of the natural gum obtained from the strains of Rhizobium radiobacter ATCC 6466 21 and Agrobacteruim sp. ATCC 31750 22. CONCLUSION: The current research focused on the isolation of fifty Agrobacterium sp. from root nodules of leguminous plants from different regions of Coimbatore and Palakkad. Among them, the A43 was selected and identified as Agrobacterium fabrum and characterized for the production of Curdlan under the optimum condition. About 0.12 g of curdlan was produced from 1.2 g/100 ml cell weight. This compound was stored for further studies on cancer. Sutherland IW: Microbial Polysaccharides from Gram-negative bacteria. International Dairy Journal 2001; 11: 663-674. Mangolim CS, da Silva TT, Fenelon VC, Koga LN, Ferreira SBDS, Bruschi ML and Matioli G: Description of recovery method used for curdlan produced by Agrobacterium sp. IFO 13140 and its relation to the morphology and physicochemical and technological properties of the polysaccharide. PLoS ONE 2017; 12(2): e0171469. Zhang R and Edgar K: Properties, chemistry and applications of the bioactive polysaccharide curdlan. Biomacromolecules 2014; 15: 1079-1096. Martinez CO, Ruiz SP, Fenelon VC, Morais GR, Baesso ML and Matioli G: Characterization of curdlan produced by Agrobacterium sp. IFO 13140 cells immobilized in loofa sponge matrix, and application of this biopolymer in the development of functional yogurt. J Sci Food Agric 2016; 96: 2410-2417. Novak M, Synytsya A, Gedeon O, Slepička P, Prochazka V and Synytsya A: Yeast β(1–3),(1–6)-Dglucan films: preparation and characterization of some structural and physical properties. Carbohydr Polym 2012; 87: 2496-2504. Khan T, Park JK and Kwon J: Functional biopolymers produced by biochemical technology. Korean J Chem Eng 2007; 24: 816-26. Ruffing AM and Chen RR: Transcriptome profiling of Curdlan producing Agrobacterium reveals conserved regulatory mechanisms of exopolysaccharide biosynthesis. Microbial Cell Factories 2012; 11: 17. Yu X, Zhang C, Yang L, Zhao L, Lin C, Liu Z and Mao Z: CrdR function in a curdlan-producing Agrobacterium sp. ATCC31749 strain. BMC Microbiol 2015; 15: 25. McIntosh M, Stone BA and Stainisich VA: Curdlan and other bacterial (1→3) β- D- glucans. Applied Microbiology and Biotechnology 2005; 68: 163-173. Sharma PK, Sarital S and Prell J: Isolation and characterization of an endophytic bacterium related to Rhizobium/ Agrobacterium from wheat (Triticum astivum) roots .Current Science 2005; 89: 608-610. Donot F, Fontana A, Baccou JC and Schorr-Galindo S: Microbial exopolysaccharides: Main examples of synthesis, excretion, genetics and extraction. Carbohydr Polym 2012; 87: 951-962. Zhang H, Nishinari K, Williams MAK, Foster TJ and Norton IT: A molecular description of the gelation mechanism of curdlan. Int J Biol Macromol 2002; 30: 7-16. Hahn Y A: The Congo red reaction in bacteria and its usefulness in the identification of Rhizobia. Canadian Journal of Microbiology 1966; 12: 725. Triveni R, Shamala TR and Rastogi NK: Optimised production and utilization of exopolysaccharide from Agrobacterium radiobacter. Process Biochem 2001; 36: 787-795. Rao NS: Response of crops on Azospirillum inoculation in India. In: Associative N2 fixation I (Vose DB and Ruschel AD (eds)), CRC press, U.S.A. 1981; 137-144. Lee JW, Yeomans WG, Allen AF, Kaplan DL, Deng F and Gross RA: Microbial production of water soluble non curdlan type exopolymer-B with controlled composition by Agrobacterium sp. Biotechnology Letters 1997; 19: 1217-1221. Anane RF, Sun H, Zhao L, Wang L, Lin C and Mao Z: Improved curdlan production with discarded bottom parts of Asparagus spear. Microb Cell Fact 2017; 16: 59. Lee JW, Yeomans WG, Allen AF, Kaplan DL, Deng F and Gross RA: Exopolymers from curdlan production: Incorporation of glucose-related sugars by Agrobacterium sp. Stain ATCC 31749. Canadian Journal of Microbiology 1997; 43: 149-156. Lee JH, Lee IY, Kim MK and Park YH: Optimal pH control of Batch Processes for production of curdlan by Agrobacterium sp. Journal of Industrial Microbiology and Biotechnology 1999; 23: 143-148. Martinez CO, Ruiz SP, Nogueira MT, Bona E, Portilho M and Matioli G: Effective Immobilization of Agrobacterium sp. IFO 13140 Cells in Loofa Sponge for Curdlan Biosynthesis. Molecules 2015; 20: 7957-7973. Salah BR, Jaouadi B, Bouaziz A, Chaari K, Blecker C, Derrouane C, Attia H and Besbes S: Fermentation of date palm juice by curdlan gum production from Rhizobium radiobacter ATCC 6466TM: Purification, rheological and physic-chemical characterization. LWT-Food Science Technology 2011; 44: 1026-1034. Kim MK, Ryu KE, Choi WA, Rhee YH and Lee IY: Enhanced production of (1→3) β- D- glucan by a mutant strain of Agrobacterium sp. Biochemical Engineering Journal 2003; 16: 163-168. Laxmi VM, Latha D and Jayasree AS: Production and characterization of curdlan from Agrobacterium sp. Int J Pharm Sci & Res 2018; 9(11): 4871-74. doi: 10.13040/IJPSR.0975-8232.9(11).4871-74. Authors Address: Division of Microbiology, School of Biological Sciences, CMS College of Science and Commerce, Chinnavedampatti, Coimbatore, Tamil Nadu, India.